At the frenzied height of our current technological gold rush, the denizens of America’s West Coast cities can have almost anything delivered within 24 hours—food, toilet paper, shoes, marijuana, and so on. But during California’s first boom, it typically took more than 100 days for goods or people to reach San Francisco from the East Coast. Getting there at all was a death-defying feat. These harrowing oceanic journeys around South America’s Cape Horn were made by the famous clipper ships, named because they moved at such a fast clip, at a time when there was no quick route over land. Today, in modern San Francisco, the land of disjointed public-transit systems, riders are encouraged to purchase a Clipper Card (emblazoned with an abstracted ship in full sail), which offers holders a slightly speedier ride via smoother transfers and lower fares. It’s anyone’s guess how long these plastic cards will remain in use, but the original clipper ship era was short-lived, lasting roughly from the late 1840s through the 1860s. 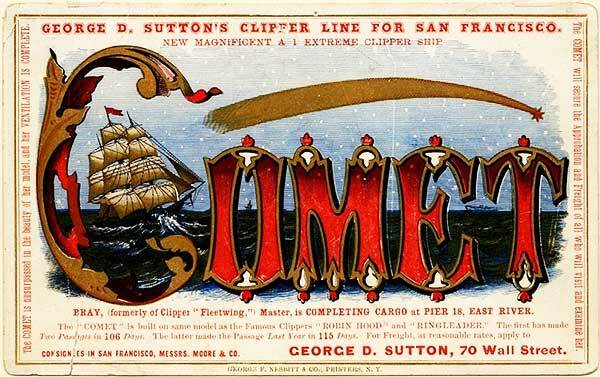 Still, the ships became legendary because their dangerous voyages thrust the West Coast into the future: Clipper ships delivered essential goods needed to build the region’s new cities and railroads, while their advertising campaigns were fortuitously timed to take advantage of new developments in full-color printing. 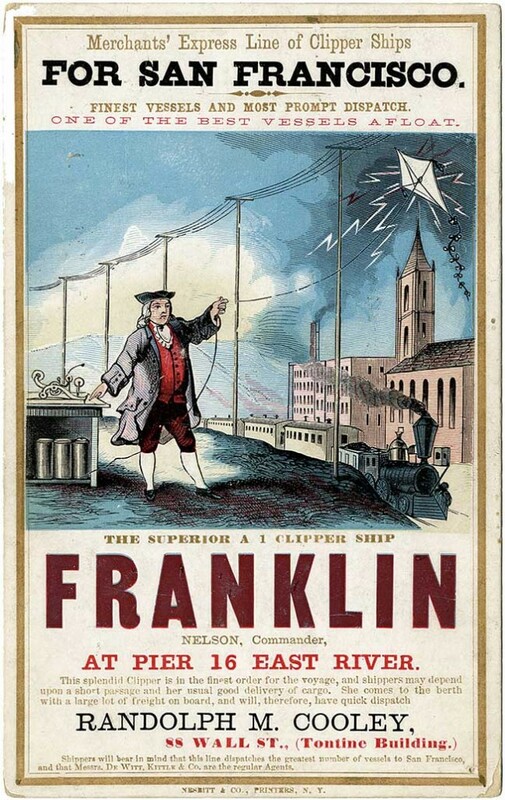 Author and researcher Bruce Roberts explores the evolution of advertising for clipper ship journeys in his 2007 book, Clipper Ship Sailing Cards. 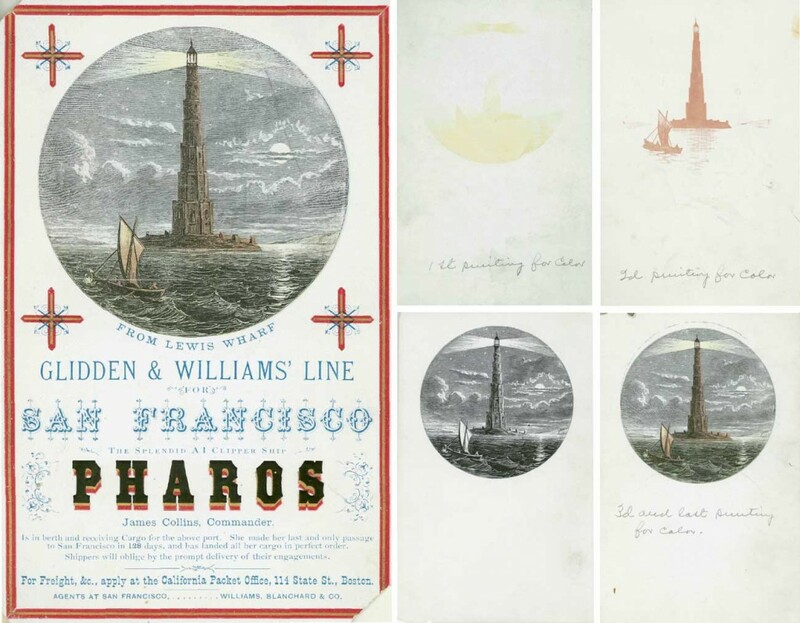 Using these advertising cards as his entry point—think of them as postcard-sized fliers, the popup ads of their day—Roberts opens a window into a fascinating period in the history of transportation, printing technology, and graphic design. In his book, Roberts explains that the clipper ships’ forebears date to the War of 1812, when the U.S. government hired privateers, or privately owned ships, to assist their attacks on the British navy. These vessels were mostly schooners and brigantines, which were small, speedy, and easy to maneuver, making them very effective against England’s fleet of well-armed but larger and slower ships. 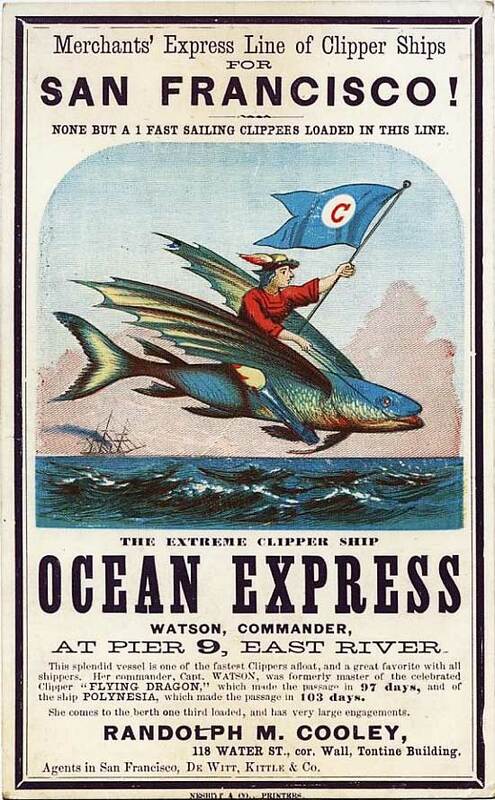 Top: A flying fish conveys the skillful skippering of the Ocean Express, circa 1862. 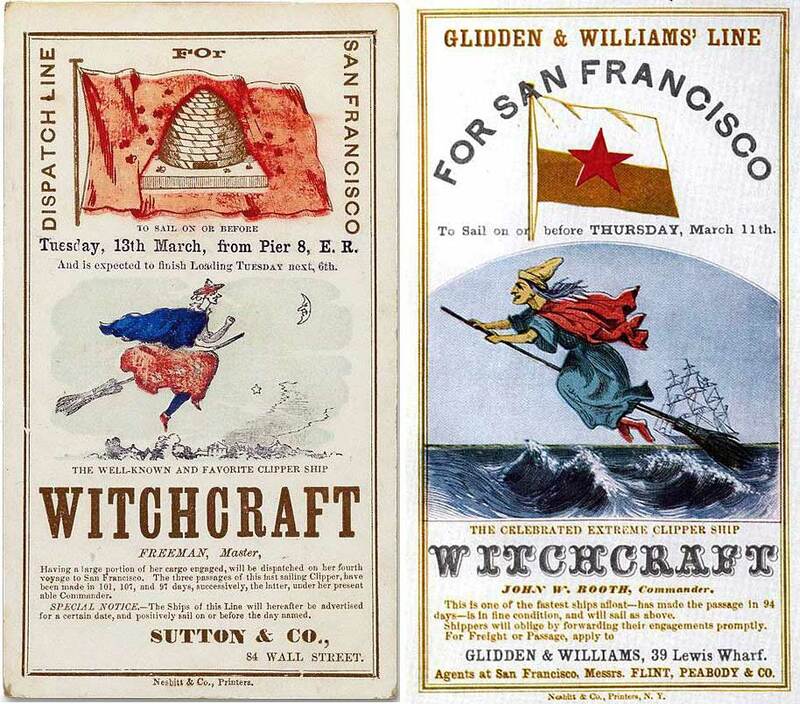 Above: Two cards for the Witchcraft rely on similar imagery, at left, 1855, and right, late 1858. Courtesy Wikimedia and the MIT Libraries. Because designs continued to evolve, Roberts says there’s no agreement on which was the very first clipper ship. Upon its completion in 1845, the Rainbow became the first ship built with a concave or inward-curving bow, which would soon become essential to the clipper design. The following year, a ship called the Sea Witch upped the ante with its additional sparring (the horizontal yards attached a ship’s mast and used to hold rigging), as the extra sails increased its potential speeds. Roberts points to the Sea Witch’s voyage to China in December of 1846 as the launch of the clipper ship era, as it heralded a period of booming trade and decreasing transit times. This card for the Franklin linked the ship with various technological achievements, including the iconic Benjamin Franklin and his kite, circa 1860s. Courtesy American Antiquarian Society. 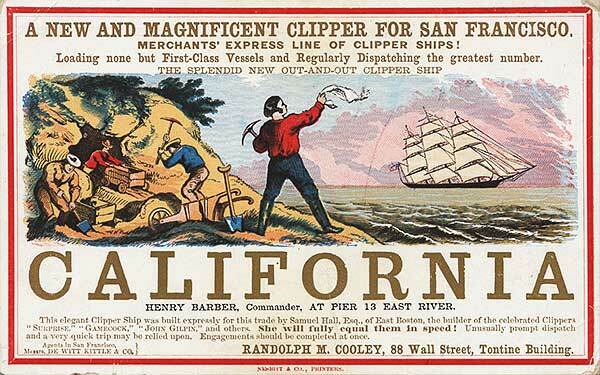 In 1848, the same year California was ceded from Mexico to the United States, gold was discovered near the American River, instigating a large migration westward and a sudden demand for more clippers. 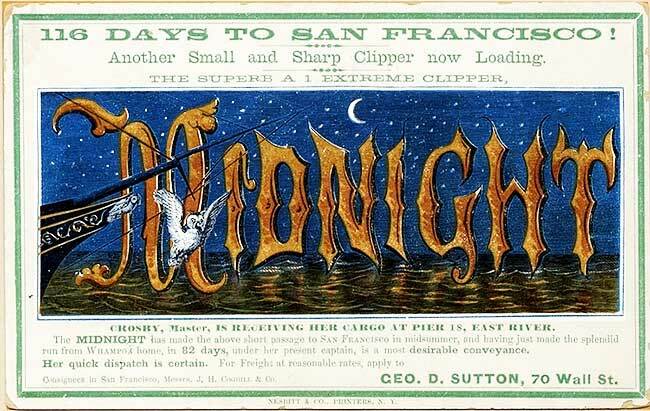 The so-called “extreme clipper” developed from this Gold Rush mentality: With smaller cargo areas but faster travel times, California-bound extreme clippers were highly profitable because of the exorbitant prices they charged their freight customers. 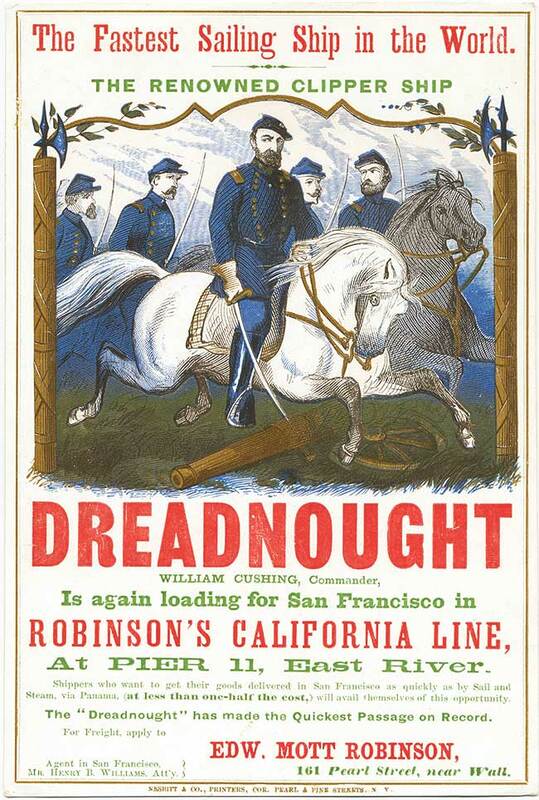 A card for the Dreadnought, named after a series of famous warships, printed by George Nesbitt & Co. in 1865. Courtesy Bruce Roberts. Barely larger than modern postcards, clipper ship cards were generally printed a few weeks before a ship’s planned departure date, then sent to local merchants and posted publicly to entice potential customers. “Just about anything you could think of was being shipped—food products, tools, building materials,” Roberts says. “Clippers were also carrying lots of components to build railroads in California.” Ultimately, once these rails stretched clear across the western United States, their freight capacity would contribute to the clipper industry’s downfall. 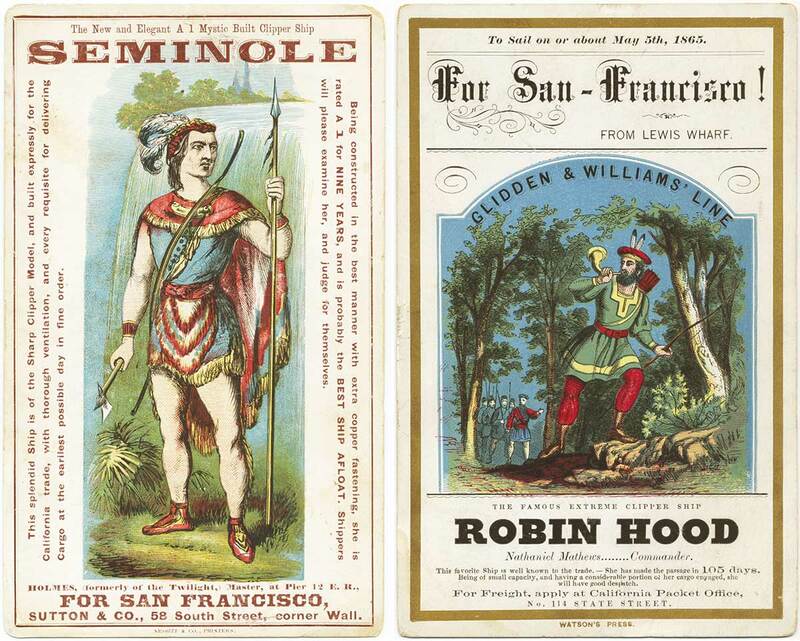 Left, a Nesbitt card from 1865 advertising the Seminole. Right, a Watson design for the Robin Hood, also from 1865. Courtesy Bruce Roberts. This 1859 Great Republic card is a rare double-sided design with patriotic imagery, including the seals of 33 states, on the front (left) and textual information on the back (right). Courtesy Bruce Roberts. 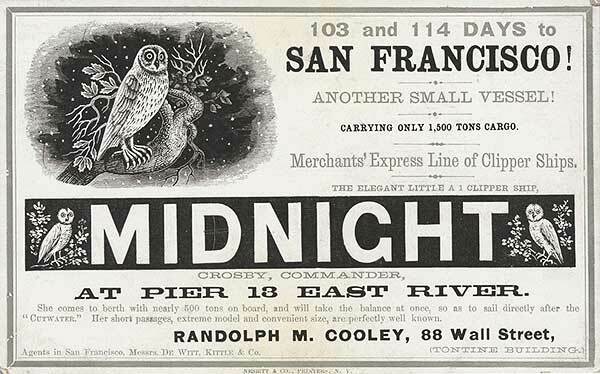 A clipper card for the Midnight, printed in 1865. 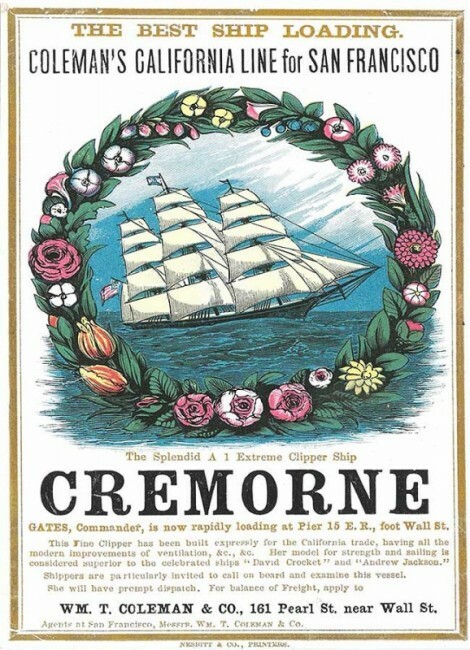 A card for the Cremorne, circa 1860. Courtesy the Peabody Essex Museum. A Comet clipper card, circa 1855. Via Wikimedia. 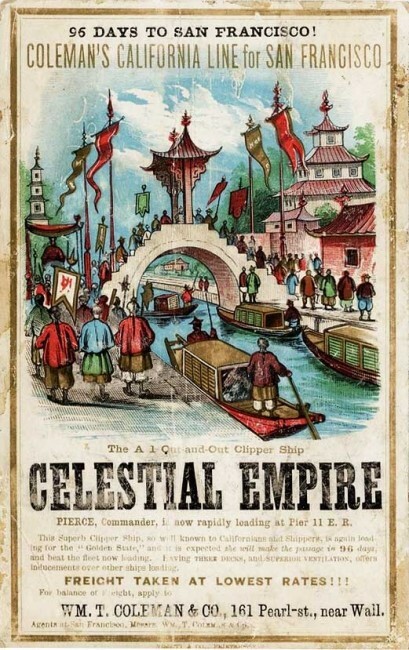 A Celestial Empire clipper card, circa 1860. Via Wikimedia. 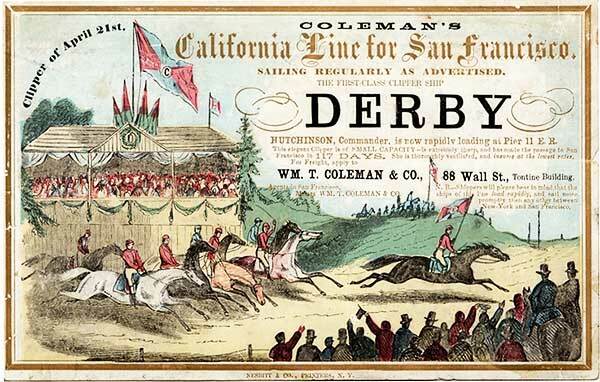 An elaborate clipper card for the Derby, circa 1858. Via Wikimedia. 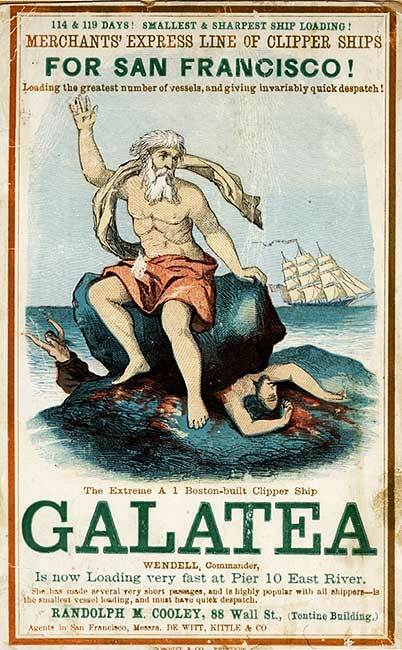 A card from the 1850s for the Galatea, named after a Greek goddess whose lover, Acis, was crushed by Polyphemus. Via Wikimedia. 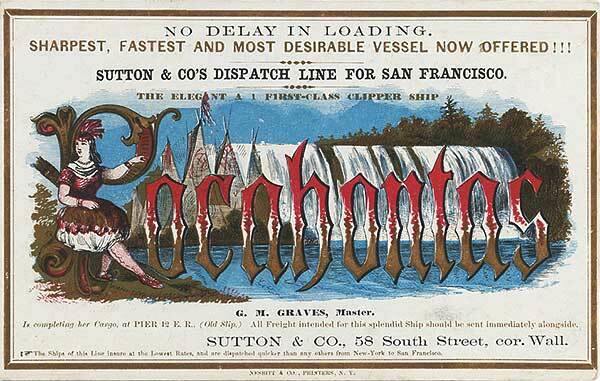 A clipper card advertising the Pocohontas, circa 1864. Courtesy Harvard's Baker Library. 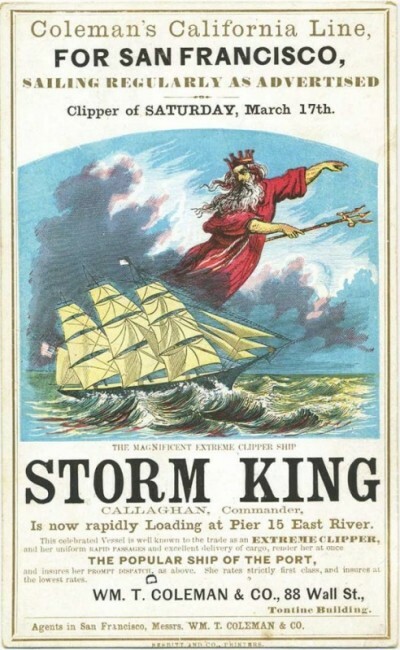 A Storm King card, circa 1860. Courtesy Bruce Roberts. 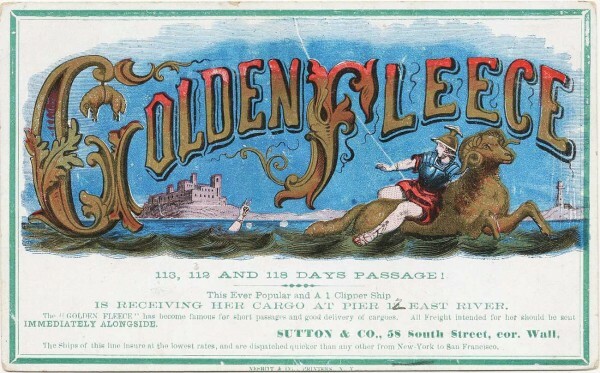 A Golden Fleece clipper card, circa early 1860s. Via Wikimedia. 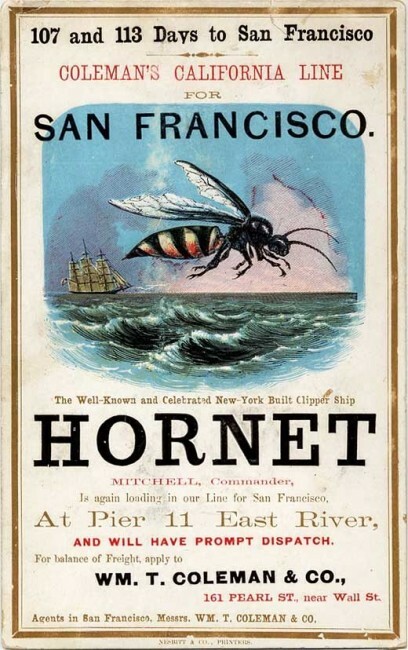 A Hornet clipper card, circa 1850s. Via Wikimedia. 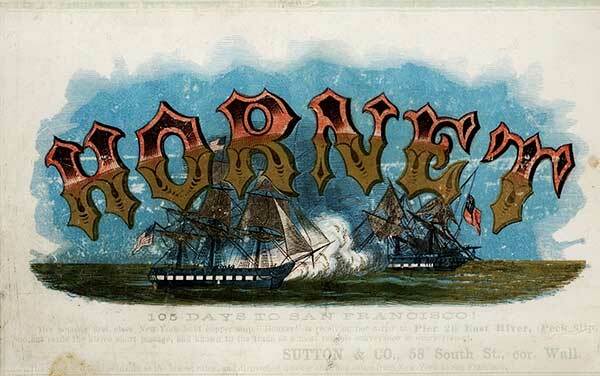 Another Hornet clipper card with ornate lettering, circa 1863. Via Wikimedia. 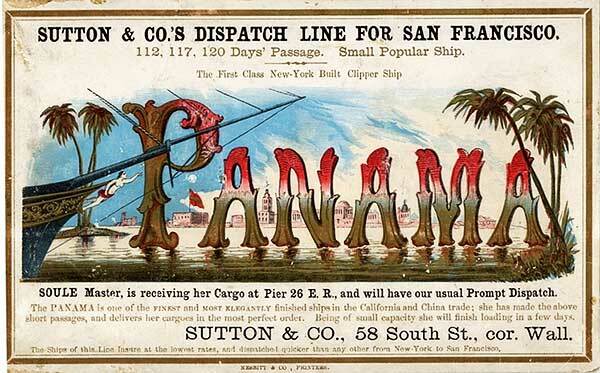 Exotic scenery dominates this clipper card for the Panama, circa 1855. Via Wikimedia. 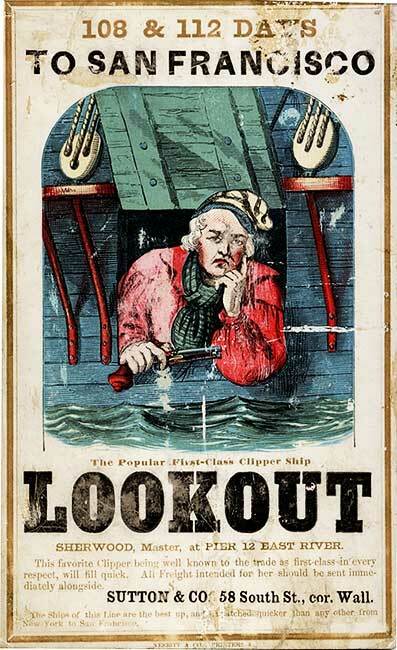 A Lookout clipper card, circa 1855. Via Wikimedia. 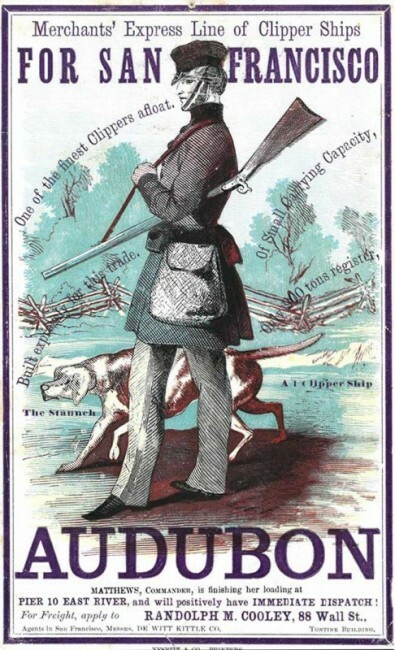 The absence of color works well on this Midnight clipper card, circa 1855. Via Wikimedia. 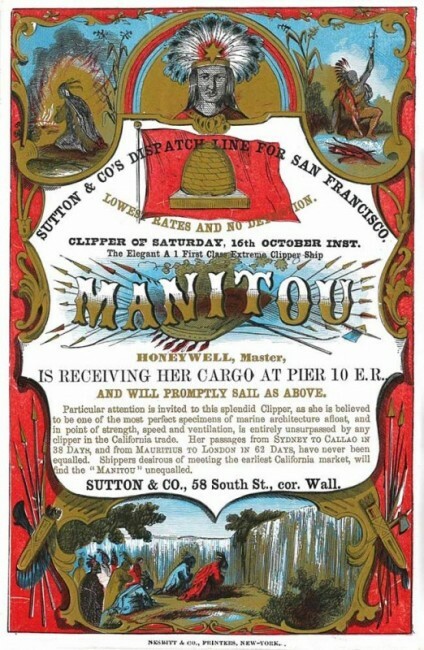 A Manitou clipper card, circa 1860. Courtesy the Peabody Essex Museum. 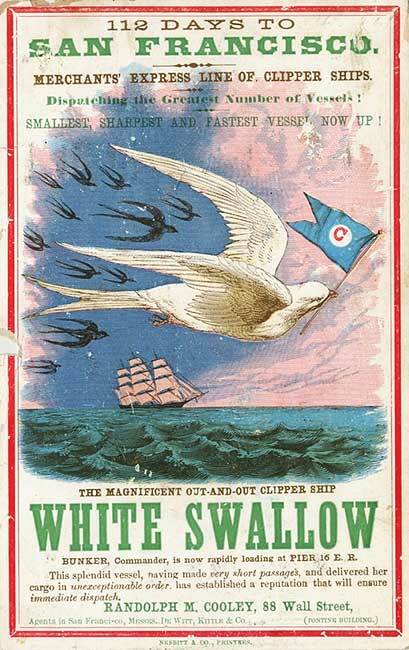 A clipper card for the White Swallow, circa 1855. Via Wikimedia. 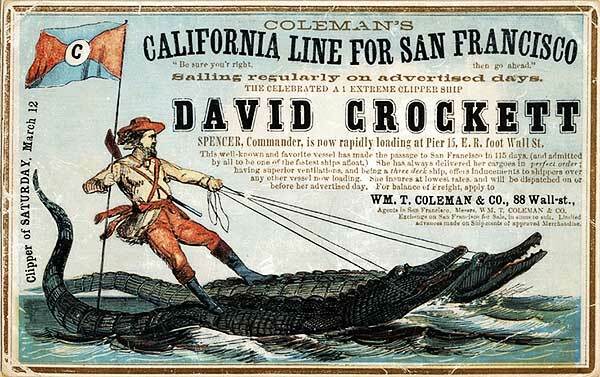 A clipper card for the David Crockett, circa 1860. Via Wikimedia. 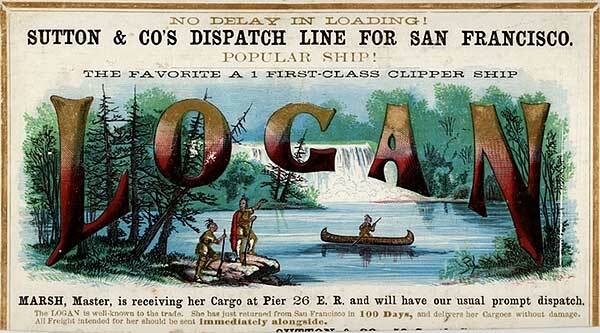 A clipper card for the Logan, circa 1855. Via Wikimedia. An Audubon clipper card, circa 1850s. Courtesy the Peabody Essex Museum. 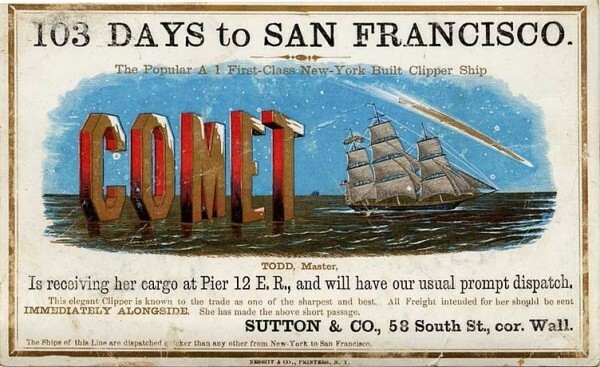 Another clipper card for the Comet, circa 1850s. Via Wikimedia. Sometime, the obvious angle is the best, like this card for the California, circa 1860. Via Wikimedia. “ ” Lon Chaney, Boris Karloff, and Bela Lugosi made it cool to be scared.